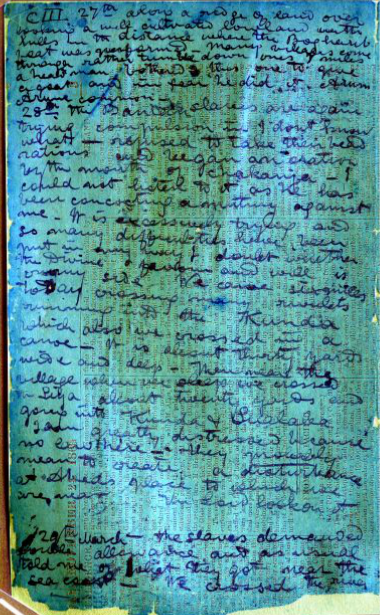 The David Livingston Spectral Imaging Project at UCLA has succeeded in rendering Livingston’s fragile and mostly illegible diary available for modern readers. Livingstone wrote his diary on newspaper print with ink he made from berries. The Spectral Imaging Project not only makes the text legible, it has transcribed and digitized the entire document, and made it accessible on the web for free. The project is an impressive realization of the promise of digital humanities. Read an account of this project at the Smithsonian Associates.